Prize-winning photographer Yan Wang Preston (b. 1976, Henan Province, China) is an early career, British-Chinese artist interested in how landscape photography can challenge myths and reveal the hidden complexities behind the surface of physical landscapes. Previously trained in Clinical Medicine in Shanghai, Preston begun to pursue a career in photography with her immigration to the UK in 2005. 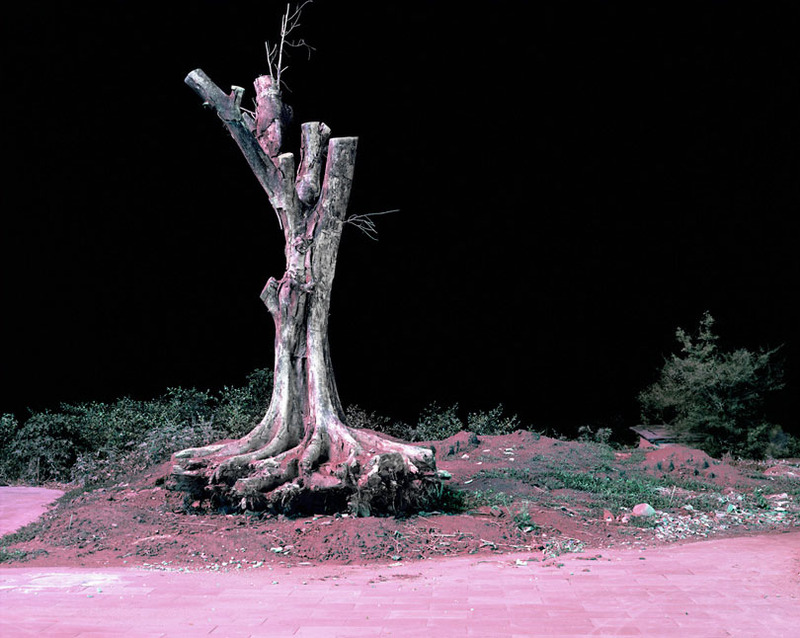 Since 2011 Yan Wang Preston has been developing a long-term project entitled Forest, from which Night (2013) originates. One of several images of China at night with its lit-up trees, buildings and streets documented during her travels, in a small town called Luzhou in Sichuan Province, where she encountered a forlorn looking dead tree in a public square surrounded by festivities. The tree was bathed in a dim red-light, rendering it otherworldly and sculptural. Through Preston’s curiosity about the revelatory qualities of the landscape, a hauntingly compelling image has emerged. Yan Wang Preston has won many international awards and exhibited widely. Recently she completed a major project, Mother River, which involved photographing the entire 6,211km Yangtze River in China with precise intervals every 100 kilometres. In 2015, this project was presented at the 56thVenice Biennale and selected for the 2015 UK-China Year of Cultural Exchange. Mother River also won the Shiseido Photographer Prize at the Three Shadows Photography Annual Award in Beijing, China (2016) and was nominated for the Prix Pictet Award (2015 & 2016), winning the Reviewers Choice Award at FORMAT Portfolio Review in Derby, England (2014). An earlier project, Forest was exhibited at CENTER in Santa Fe, USA in 2013, winning the Curator’s Choice Award and in 2017 also won first prize in the Professional Commission Category of Syngenta Photography Prize and was subsequently shown at Somerset House, London. A selection of Yan Wang Preston’s recent solo exhibitions includes Forest, exhibited at theXposure Photography Festival,Sharjah City, UAE (2018), the Atlantic Project, Plymouth, UK (2018) and GETXOPHOTO, Getxo, Spain (2017). Mother River at Gallery of Photography Ireland, Dublin, Ireland; Impressions Gallery, Bradford, UK (2017); China Three Gorges Museum, Chongqing, China; Wuhan Art Museum, China and the 56th Venice Biennale, Italy (2015). Selected Group Exhibitions include 40 Years of Chinese Contemporary Photography, OCAT, Shenzhen, China (2018);Ten Directions: the 10th Anniversary Exhibition of Three Shadows Photography Awards at The Three Shadows Photography Art Centre, Beijing, China (2018); Parallel 2017at C-Art Centre, Chongqing, China; Syngenta Photography Award, Somerset House, London, UK, (2017). Dubai Photo Exhibition Dubai, United Arab Emirates; Pondyphoto 2016, Pondicherry, India; Flow – British and Chinese Landscape Artists,Xu Space, Chongqing, China and Cherish: Chinese Families in Britain National Portrait Gallery, London, UK (2007). Both Forest and Mother River are published as Preston’s first and second monograph by Hatje Cantz in 2018. Key magazine features include European Photography (2018), PhotoNews (2018), Post (2017), British Journal of Photography(2017), China Life Magazine (2016), Chinese Photography (2015) and the Royal Photographic Society’s Journal (2015). Her work is collected by public institutions such as the Wuhan Art Museum in China, by Syngeta Ltd, Swatch Ltd, and by private collectors around the world. Preston lives and works in the UK and has recently completed a PhD in Photography at theUniversityof Plymouth.